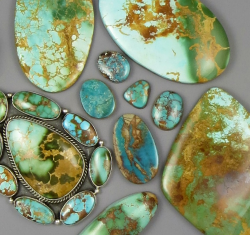 The wide variety of colors and patterns available in turquoise is usually dependent on the concentration of minerals in the area from which the stones were mined, making each piece of turquoise as unique as the area it comes from. 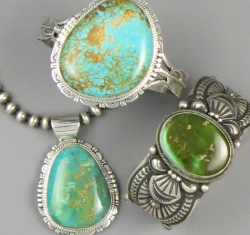 The high concentration of copper in Arizona’s soil gives this turquoise a cool blue color palette, while Nevada’s turquoise tends to have a rich, green hue, due to the large amount of iron in the that region. Since the splendor of turquoise comes from the rich variation in color and webbing, each region has its own trademark. 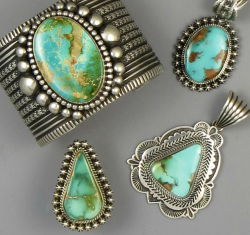 Discover the wide variety of turquoise we offer, and choose one of these striking stones for a stunning piece of real Native American turquoise jewelry. The Dry Creek Mine is known for its creamy, almost pastel colored turquoise, while bold emerald-hued stones all hail from the Manassa Mine. For some of the wildest color variation, stones from the Royston Mine feature the most dramatic turquoise on the market. 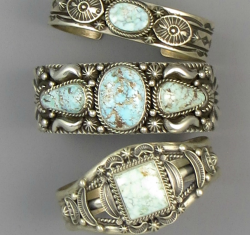 We also carry turquoise that hails from the Kingman, Pilot Mountain, and Turquoise Mountain Mines. 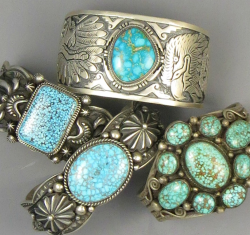 At Southwest Silver Gallery, we want to share the most beautiful pieces of real Native American turquoise jewelry with our customers, so we source all our jewelry from master craftsmen from local Navajo, Zuni, Hopi, and Santo Domingo tribes. Most of our pieces come with a certificate of authenticity, signed by the artist. 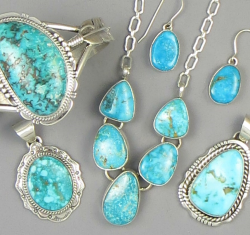 If you have any questions about our real turquoise jewelry, please don’t hesitate to get in touch with us at 1-888-476-4367.